Team Victory claimed the 2012 Las Vegas Open in convincing fashion. Hadland Park, Las Vegas, May 28, 2012 — Tournament MVP Rex De La Nuez went 4-for-4 with one RBI, and allowed no runs on two hits in four-and-a-third innings of as Team Victory of Orange County, Calif., a tournament Wildcard, defeated the Salt Lake Evil Empire 13-8 to claim 45+ Vegas Open gold. The win returned Team Victory, a perennial men’s baseball powerhouse, to the gold medal podium at this well known adult baseball tournament for the first time since 2009. Team Victory put the game away with a five-run eighth inning that broke an 8-8 tie. Dale Eby, De La Nuez’s and Frank Bons had RBI singles and John Love slugged a two-run single in the decisive rally. De La Nuez came out of center field to relieve starter Tony Corona with two outs in the bottom of the fifth. He retired the lone batter he faced in that frame. In the bottom of the ninth he walked a hitter, allowed one of his two hits, and hit a third batter but induced Empire slugger Brady Field to line out for the final out of the game. 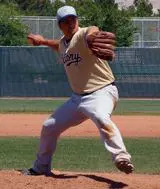 De La Nuez was the winning pitcher in Team Victory’s semifinal contest – a 23-5 whitewashing of the Halo Baseball Club. Love was 2-for-3 for five RBI on the game. Teammates Bons, Pone, Pokey Sanchez and Purvis Cowens each had two hits for Team Victory which entered the championship game on a red-hot offensive tear. Team Victory’s only loss was a 4-3 loss to the Bethlehem Stars. They won their next four games by scoring 73 runs in 29 innings. “We have a very deep lineup,” said Team Victory manager Rafael Fuentes. Team Victory scored five runs on seven hits and sent 11 batters to the plate in the top of the third, when they claimed a 7-2 lead. Sanchez’s RBI single started the rally, Love’s RBI double brought in Sanchez while both Ray Alcaraz and Fuentes stroked RBI singles later in the frame. narrowed Team Victory’s lead to 7-6 with four runs in their half of the third. Ray Wanlass had an RBI double to start the rally before two runs came in on Neil Warner’s and Field’s RBI singles and another was plated when Dave Carter reached on a fielder’s choice. Team Victory, which never trailed in the finals, made it 8-6 in the fourth on Love’s sacrifice fly that sent De La Nuez home. Evil Empire tied the score at 8-8 in the fifth on Carter’s two-rundouble. “We usually don’t separate early in the tournament; it usually is later,” said Brunette about his team’s eighth-inning rally that decided the game. Miles led Evil Empire with three hits, while Carter, Valdez, Wanlass, Warner and Field each had two hits. “They were by far the best team we played for sure,” Brunette said. “They were good hitters who played hard and played the game the right . way,” Fuentes said. Team Victory does a team prayer before Vegas Open finals. WP-De La Nuez. LP- Bittner. Leading Hitters (Victory) De La Nuez 4×4, 1 RBI; Love 2×3, 5 RBI; Bons 2×3, 2 RBI; Pone 2×4; Sanchez 2×5, RBI; Cowens 2×5. (Empire) Carter 2×4, 2 RBI; Miles 3×4; Valdez 2×4; Wanlass 2×5; Warner 2×5, RBI; Field 2×5, 1 RBI. 2B: Sanchez (TV), Love (TV), Miles (EE), Wanlass (EE); Carter (EE). The Salt Lake Evil Empire had a good run at the 2012 Las Vegas Open.